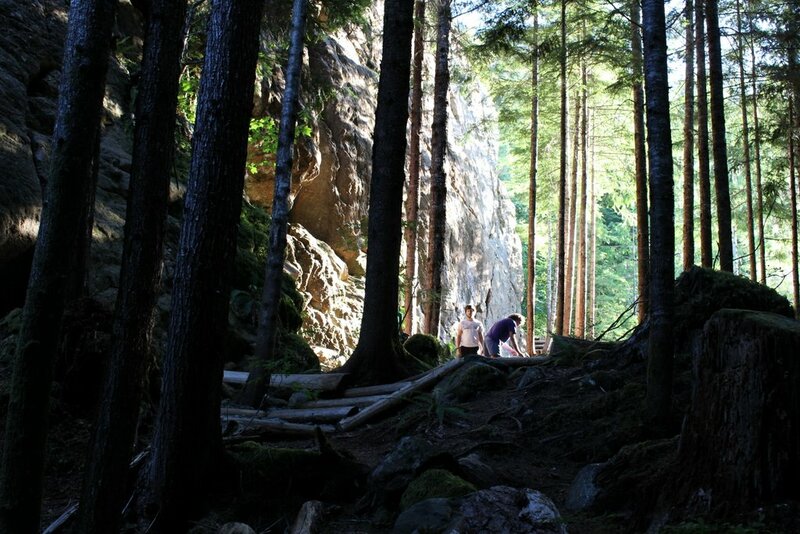 Crest Creek is an introverted climber’s paradise. Unlike nearby Squamish, there are no crowds, no ferries, no cell phone coverage and no kids in your campground blasting their boom boxes at 1:00am. There are just friendly climbers, trees and routes for days. The crags here are meticulously maintained by a group of volunteers called the Heathens. Over the past thirty years, they’ve built up an intricate network of trails, stairs and platforms. The climbing area isn’t that large, so it was easy to run into the same people every day. Our group ended up making a number of new friends and climbed with them throughout the weekend. The hand drawn climbing guide for the area is available at On the Rocks climbing gym in Campbell River. My favourite touch is the tiny green pencil-drawn trees filling in the spaces between crags. This trip was special to me, as it was my first time climbing since I strained a tendon in my hand in May. I was only able to climb a few routes and super easy ones at that — but every time I touch the rock, I was so happy. To keep myself busy while not climbing, I took a lot of pictures with my new DSLR camera (!!!!). One day, I set up a static lined and hung our on a rappel for around 45 minutes. This let me take climbing photos from angles I never have before. Here is as close as I could come to taking a selfie with my DSLR: a picture of my harness and rope. No more photos of climbers’ butts for me! While I was up there, I took this photo two guys free soloing (climbing without ropes). Crazy, but fun to watch. I love this picture of my friend Carrie coiling rope at the end of the day. My previous attempt was photo bombed, though. Part of what made this trip so relaxing was our amazing camping spot. Everything at the provincial campground was full, but we found a secret spot not too far away. I would tell you where it was, but then I’d have to kill you. On one of our last days there, we headed down to check our Myra Falls. The water was freezing, but that didn’t stop anyone from swimming. A few guys were taking huge jumps of rock ledges. Strathcona Park will always be one of my favourite spaces and Crest Creek just makes it all the more awesome. A lot of the routes are mixed (bolts + trad), but so many of the anchors you can easily access very comfortably by well marked trails. It’s actually a great place to teach someone how to build and anchor and rappel, as two people can stand in front of the anchor on flat ground in many cases. I’d bring really long slings for your anchors, so your rope doesn’t rub over the edge. We top roped a lot without ever running out of things to do. Hey! I’m heading up to crest creek this Sunday night, and I won’t be able to grab a guidebook on the way (on the rocks closed before we will reach campbell river, and on Monday). I’m wondering if I could buy or borrow your guidebook for the week? It would be a huge favor, let me know!